Wellbeing, education, counselling, complementary therapy, business or organisational management, workplace wellbeing, life-coaching, health, mental health, disability etc. Adapt the programme for different audiences, such as children, specific needs groups. The training will take the form of a weekend course (15,16,17 November 2019) plus a portfolio. 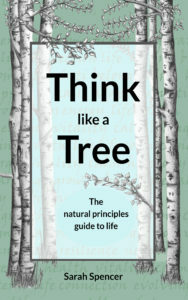 Note: you will also need to complete a Think like a tree six week programme prior to the training course. The training is suitable for anyone with relevant experience wanting to teach the Think like a tree programme or integrate the principles into their own discipline. An optional one-day course to adapt the Think like a Tree concept and content for children will take place on Friday 13th March 2020. This will be open to anyone who has completed the facilitator course. The children’s course will involve an additional short portfolio. This course is suitable for anyone who has experience of working with children. Pricing: Please get in touch for details of the pricing of the facilitator training. This training is suitable for people from a wide variety of disciplines, individuals, businesses and organisations. We are already working with national organisations to roll the Think like a Tree concept and nature-inspired wellbeing and nature-inspired ways of living.